As a sales leader for 15+ years, I’ve always thought it’s crazy that we arm our reps to the teeth with CRMs, selling frameworks and automation, but we don’t give our prospects, the ones with all the money and none of the time, any tools at all. Smart sales teams allocate budget towards tools that make the sales process easier for prospects. Your prospects have their own jobs, their own priorities and their own bosses, so unless you do something special, your proposal may well fall to the bottom of their list, not because they don’t want to hear more, but because your solution is not more important than what they’re already working on. There are two ways to approach this. First, you can try to bump your deal up their priority list by delivering a killer compelling event. The challenge is (a) their list is already full of top priorities and (b) your competitors are doing the exact same thing. The second approach is to make the process easier for the prospect, so they can slip it into their schedule without affecting their other priorities. Assuming you know where they are on their buyer’s journey and you’ve already done your best to create that compelling event, here are three proven tactics you can take to make the job of evaluating your proposal - and keep it moving forwards - a lot easier for your prospects. A deal room puts the entire deal in one place, so your prospect has to do less work throughout the sales cycle. The most basic deal room is just a place to share documents (think DropBox), but those services come with challenges of their own, like making the prospect do work to sign up for yet another service and lacking context on why a particular file was shared. 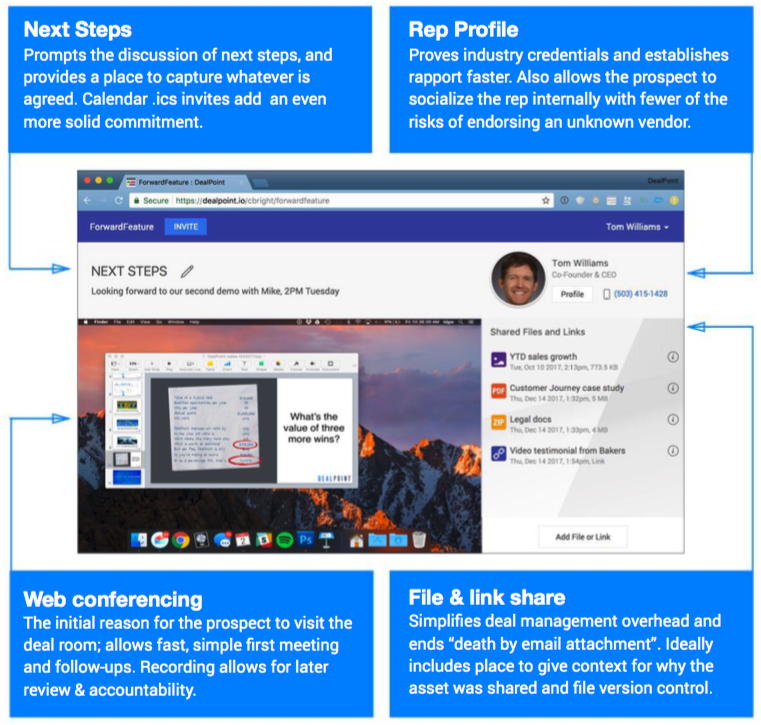 Deal rooms designed specifically for sales teams will have integrated web conferencing, so prospects are just dropped into the room as part of the initial demo. The best include a place to capture next steps to keep the deal moving forward. Deal rooms make it easier for prospects to see the value proposal because having everything in one place provides context AND stops the prospect from having to dig around in email to get your collateral. Perhaps more importantly, having everything in one place makes it easier for the prospect to socialize your deal inside their organization. Instead of trying to paraphrase your value prop, they can just invite other decision makers to join the deal room to see for themselves. This provides a third benefit of improved customer engagement data: you can see every click and invite, so you can see which customers are engaged and which deals should get kicked to the curb. One simple yet effective tool to give to your prospects is a “champion” version of your sales deck. Take your standard deck and optimize it for this particular prospect by leading with the pain points that most impact their bottom line (as discovered during qualification). If it’s plausible, you might use their industry as a lens into your argument (for example, using numbers from their industry to make your general case or even just adding images from their industry). If this champion deck looks like the content comes from a vendor, it’ll have a lot less credibility than if it looks like your champion is presenting “neutral” content, so (a) try and include analyst research or other third-party statements and (b) make it easy for them to drop the content into their own internal PPTX template by sharing the content in an unbranded 4:3 ratio editable PPTX (not PDF). Back up your value prop with curated, relevant collateral. A deal room isn’t much use without some relevant, carefully curated content. So make sure you have armed your prospects with tools to defend the credibility of your proposal when they go to bat for you internally. The most valuable support content is a case study from a peer in the industry. If you don’t have an existing customer to help tell your story, then a “use case” gets you closer to the goal of explaining how people in your prospect’s situation would use your solution to solve their pains. If a senior decision maker isn’t convinced that every detail has already been considered, they’re likely to start asking hard questions. However, if a decision maker sees that due diligence has already been done, they’re less likely to deep dive to find flaws, so don’t shy away from sharing spreadsheets and other detail to prove this deal has been well thought out already. You can also share specific content to keep them focused on the relevant parts of your value prop. For example, if you see through the deal room that a senior finance person has entered the conversation, then add a document called “The CFO’s Guide to Widget ROI” or similar and invite them to read it. Finally, if your deal room includes a rep profile and deal history, the credibility quotient shoots through the roof. Anytime you can reduce work for your prospects, you’re in a better competitive position, and the deal is more likely to close successfully.